Ed Battistella advocates for fewer apologies, given more sincerely. Did you hear the one about the politician who apologized? Yeah, neither did we. Public official apologies are usually along the lines of "I'm sorry if anyone took offense..." Notice the careful construction. Linguist Edwin Battistella of Southern Oregon University certainly noticed. 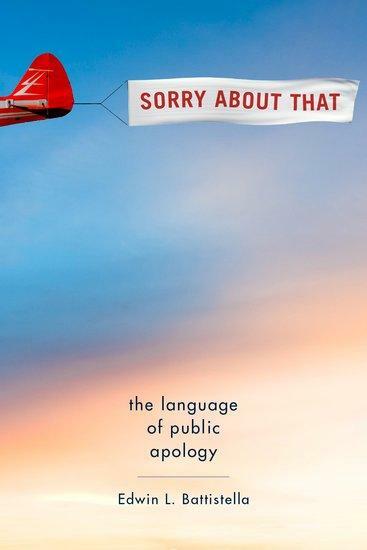 And he wrote the book on apologies: Sorry About That: The Language of Public Apology. We delve into the words and the impact of apologies. Sharon Schuman explains the concept of "dialogic freedom," so we can talk to each other across ideological lines. To understand a person, walk a mile in their shoes. Not a lot of shoe-swapping going on in the world today, is there? Historians assure us there have been other periods of polarization in American history (see: Civil War), but we have to live in this one. Unless we can do something about it.